Fiat plans to invest 700 million euros in the Naples plant to transfer Panda production there from Tychy in Poland. TURIN -- Fiat could create a new company to run a key factory near Naples that is scheduled to build the new generation of the Panda, Europe's biggest selling small car. Fiat would set up the company to run the Pomigliano d'Arco plant in central Italy if workers fail to approve a deal to change working practices to boost the factory's efficiency, sources said. Fiat plans to invest 700 million euros in the plant to transfer Panda production there from Tychy in Poland. The factory has a history of labor unrest and has the worst productivity of all five of the company's Italian plants, even taking into account slow demand for the Alfa Romeo models it currently builds. CEO Sergio Marchionne has secured approval from four of the factory's five unions for a deal that wins management greater flexibility in the number and type of working shifts as well as limits on strikes and such benefits as sick days. Pomigliano's 5,133 workers were voting Tuesday on the deal. Fiat sources said that if less than 80 percent of the workers fail to vote for the agreement, then the automaker could create a new company to run the plant. A Fiat spokesman confirmed the new company “is an option” but declined to comment further. A new company would mean the workers would have to be rehired with fresh working conditions. Last year, Pomigliano built 35,000 units of the Alfa Romeo 147, 159 and GT coupe models. 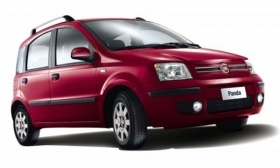 Fiat plans to start building the new Panda there in late 2011, with annual production of 280,000 units in 2012. Moving the Panda to Pomigliano is part of Marchionne 's plan to boost Italian production to 1.4 million passenger cars in 2014, compared with 650,000 last year.